The building sector is set to grow exponentially. It already has a huge environmental footprint, with the domestic and commercial sectors consuming some 30 per cent of India’s electricity. So, the imperative to go green is clear. The question is where India is and where it should go. The Bureau of Energy Efficiency (BEE) has issued the Energy Conservation Building Code (ECBC) to improve the energy performance of buildings by 40-60 per cent. But the use of the code in design is not linked to the actual performance of the building after it has been commissioned. What BEE has in addition is a voluntary star-rating scheme for operational buildings which sets the energy performance index (EPI) of four categories of buildings: day use office, IT/BPO, hospital and retail malls. EPI is calculated differently for different climatic zones. But the rating programme has no direct link to ECBC. As a result, there is no data to show what the design has achieved and no feedback loop that would improve design based on operational experience. There are two other green building certifying agencies in the country. 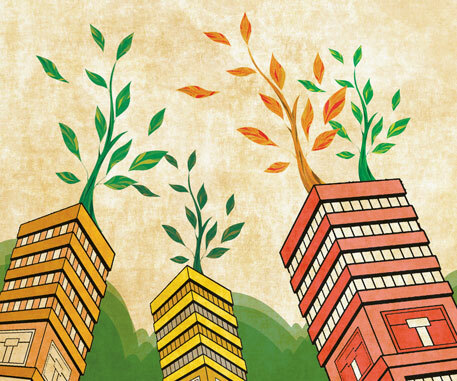 The Indian Green Building Council (IGBC) started out as a US initiative but is now wholly Indian and is promoted by CII-Sohrabji Godrej Green Business Centre. It runs a certification programme that rates buildings platinum, gold or silver, based on different criteria. Delhi-based TERI has its Green Rating for Integrated Habitat Assessment (GRIHA). Many state governments provide fiscal incentives and even bonus floor area ratio (FAR) to builders who produce green certificates from these agencies. The actual proof will, however, be in the actual use of energy and water in a commissioned building. But there is little data on this. In other words, governments are giving away largesse without any verification. A few months ago, IGBC put on its website information on the actual energy and water consumption of 50 of the buildings it had rated out of some 450. When my colleagues at the Centre for Science and Environment (CSE) analysed this data, all hell broke loose. Why? Because we found that many reputed companies that had been given platinum rating were actually energy and water guzzlers. Obviously, this is not easy for companies to accept. CII has written on their behalf arguing that we have got our analysis wrong because we have mixed up the typologies for the buildings. So, they say, ITC Saharanpur is a factory building, which has been compared to an office building. But IGBC gives its rating only for the office operations of a “factory”. CSE in its analysis used the EPI set by BEE for an office building and found that as against the EPI of 190 for a composite climate, the ITC building has an EPI of 379, which is almost double. WIPRO in Gurgaon is an IT building, with server loads operating for 24 hours. It has been compared against performance benchmarks for an office building, says CII. But CII misses the fact that when CSE compared the same building using the EPI for an IT/BPO complex—calculated as the annual average hourly EPI to take into account its extended hours—it exceeded the energy limits for them as well. Similarly, WIPRO’s office in Kolkata was found to exceed the minimum benchmark set by BEE for warm and humid climate by more than nine times. CSE analysis also finds that there are IGBC-rated buildings that match or are below the EPI set for their category for their climatic zone. So, something is working and we hope CII and its partners will ask how they can learn from the best example so that expensive green features pay off in terms of performance. More importantly, regulators need to get their act together on this issue. CSE analysis is based on self-disclosure by companies, which is not verified or audited. Government needs to build a credible system of assurance so that it can really push what is green in performance. It is time, as we say, to go beyond the green façade. Good exposure. I raised some of these in the 1st meeting of this group in Hyderabad [one such building was showcased in Hyderabad], particularly the ratings similar ISO certification.